Bicycle hangers which aim to provide secure bicycle parking to residents of inner city Dublin could just be “an excuse to sabotage car use”, according to Conor Faughnan, the director of consumer affairs of motoring group the AA. He made his comments — which mirrors his previous comments on the quays cycle route — on The Last Word with Matt Cooper on Today FM late last week. The bike hangers are being trialled by Dublin City Council’s DCC Beta Projects, a project of the city architect’s office which is trying on-street projects ranging from street art to bicycle facilities. The project team has detailed the reasoning for the hangers on their blog — highlighting the lack of space in city centre residential areas. The project blog also highlight how little space the hangers take up compared to a car space, but they do not put taking up a car space as an aim or benefit of the hangers. 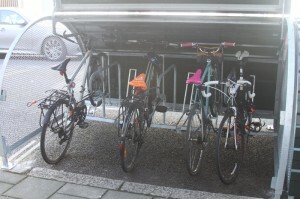 “The bike hangers are not a bad idea… but why take a parking space? And what concerns me is, are the people behind this actually taking up a parking space, almost in an act of spite? As if that was a virtue in itself. Or are they actually looking to provide for cyclists?,” Faughnan said on Today FM. Dublin Cycling Campaign (DCC) was on 98 FM with a news item by Maria Shannon on Friday 30 Jan about this same project. We welcomed its trialling in residential areas where residents have no space to even swing a cat in their boom-time apartments. We criticised planning specifications for bike parking. If a car-parking space has to be withdrawn so be it. After all the NCBI does not want any more impediments on pavements. We stated that it was time that cycling was given parity-of-esteem with car parking in our city. And why use a parking space? Look at any residential city centre area – the majority of street space is given over to car storage. The footpaths are often single-file. There isn’t a suitable alternative in the neighbourhoods the hangars are planned for. Hopefully the growing absurdity of his stance is a sign that the case for public transport and active travel is slowly gaining traction. Meanwhile in London, the (UK) AA supports ambitious plans for cycle infrastructure that – shock horror – will reduce the number of motor traffic lanes. Dear Conor, all those cars that are parked on on the street in front of my house are blocking the space that I might want to use for storage stuff, like, oh, I don’t know, sofas and old fridges and stuff. Why can’t I do that? It’s utterly bizarre that Conor Faughnan (and most people, to be fair) seem to think that public spaces should be provided for private cars. All that on-street parking does is clog up the streets. When I was a kid I used to play on the streets in front of my house. Nowadays kids can’t play on the streets because of all the bloody cars that are everywhere.